RONKONKOMA, NY — October 16, 2013 — Sigma Corporation of America a leading researcher, developer, manufacturer and service provider of some of the world’s most impressive lines of lenses, cameras and flashes, today announced its newest addition to the Sigma Art line of lenses for full-frame cameras, the 24-105mm F4 DG OS HSM. 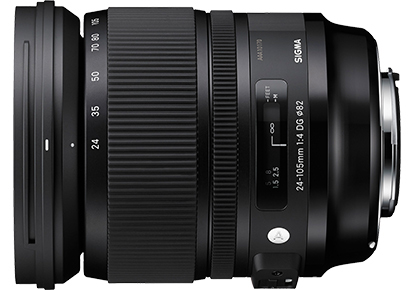 True to its categorization as a Sigma Art lens, the new 24-105mm F4 DG OS HSM is designed for artistic expression and top-notch image quality. This versatile lens covers the basic shooting range from wide to medium tele with an inner focusing system that eliminates front lens rotation, enhancing the lens stability and allowing the use of circular polarizing filters. It also boasts a constant aperture of F4, and contains Sigma’s proprietary Optical Stabilizer (OS) technology to compensate for camera shake. Moreover, it was designed to surpass the required quality inspection of every Global Vision lens with Sigma’s own modulation transfer function (MTF) “A1” measuring system to create new optical standard to align with the high-spec cameras on today’s market. Amir-Hamzeh added that this new lens combines the largest possible fixed aperture to zoom ratio that will maintain optimal integrity for many kinds of photography, including landscapes, architecture, portraiture and still-life. With a minimum focusing distance of 45cm and a maximum magnification ratio of 1:4.6, this lens is also excellent for close-up photography. High-performance glass elements, including SLD, FLD, which is equal to fluorite, and glass-molded single- and double-sided aspheric lenses have been included into the optical system to prevent aberration, field curvature, distortions and color aberration. The 24-105mm F4 DG OS HSM lens is also able to suppress chromatic aberration very effectively at the telephoto-end, and can achieve superior image quality throughout the zoom range. Unlike lenses with similar specifications, this lens overcomes low peripheral brightness. Although it is designed for full frame cameras, it also works with APS-C sensors, giving an increase to focal length. The lens’ Hyper Sonic Motor (HSM) ensures a silent, high-speed auto focus function and enables full-time manual focusing capability. 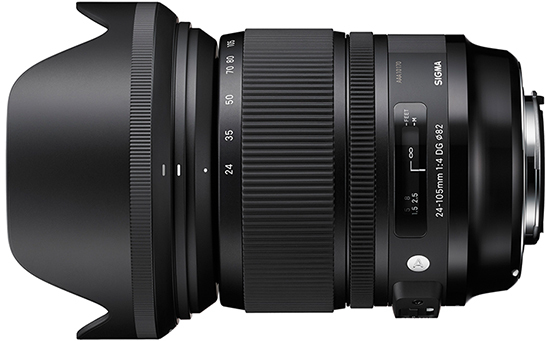 The 24-105mm is also compatible with Sigma’s USB dock allowing photographers to update its firmware and change focus parameters using Sigma’s Optimization Pro software. It is also compatible with Sigma’s recently announced Mount Conversion Service.